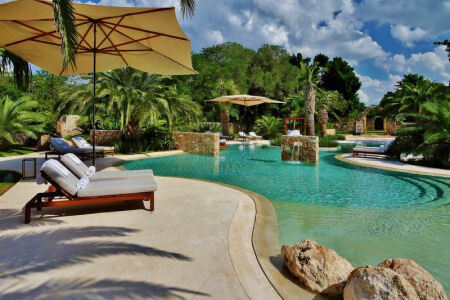 Chable Resort & Spa in Yucatan, Mexico! 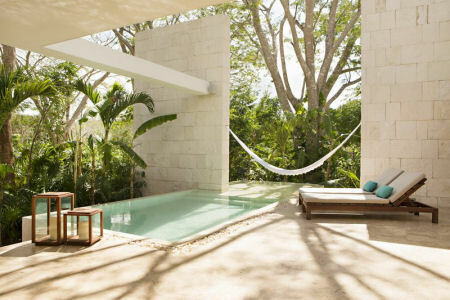 Chable Resort & Spa in Yucatan, Mexico! Bid Per Room Per Night & Choose Your Length of Stay! Conde Nast Traveler featured Chable in the Hot list 2017: "The Best New Hotels in the World"
Travel + Leisure Selected as one of "The 68 most exiciting places to stay this year"
AHEAD AMERICAS AWARDS 2017 announced Chablé was awarded as the Hotel with the "Best Landscaping & Outdoors"
As a wellness resort, Chablé Resort and Spa takes a uniquely holistic approach. 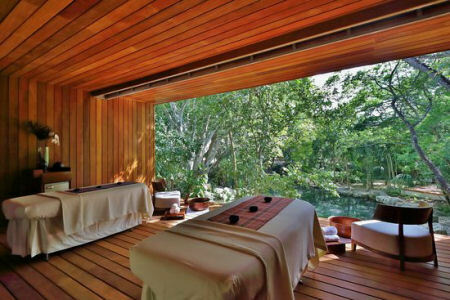 The pampering treatments of a conventional destination spa are woven into a personal wellness program allowing us to provide a more complete self indulgent experience closely tailored to each guest’s needs – with experts in different modalities, from yoga to Maya healing techniques. After an initial consultation we will devise an optimum personal program designed to match your goals, be it fitness, detoxification, stress management, weight loss or other areas of concern. We will then recommend specific treatments in conjuction with the resorts daily activities of morning yoga, guided walks, biking, meditation and nutrition. The Spa at Chablé offers a unique passage into the customized wellness exploration that guests embark upon from the moment they arrive. 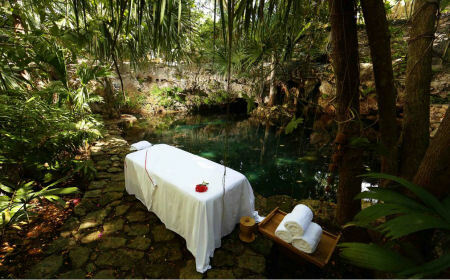 Residing in the heart of Yucatan, the Spa invites guests to enter a mystical world steeped in ancient heritage and wisdom. Traditional Mayan Culture is blended in new ways to serve as a guide for contemporary experiences. 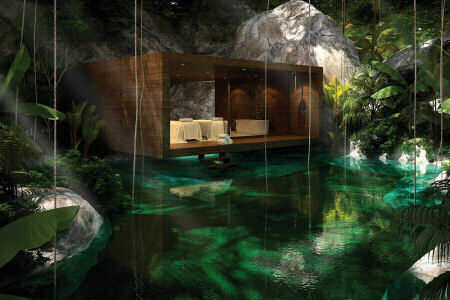 The natural Cenote at Chablé is the focal point of the healing journey, providing the curative foundations and tranquil setting for development of our spa experiences We offer a space where ancient mysticism blends with modern curiosity to bring about a new vocabulary of well-being. Offer is based on a Casita for 2. Full American Breakfast, Ground Round Transportation from Merida Airport and Daily Activities are not included and may be purchased directly from the hotel. Each casita is purposely situated within the lush gardens where nature can be enjoyed to its fullest. 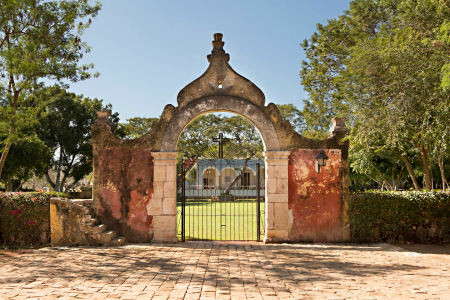 The original 19th century walls of the working hacienda serve as the framework for every casita, and incorporates modern touches, warm woods and traditional Maya architecture to make Chablé a true work of art. Every room has a view and every view is a living part of the Hacienda. Your Casita for 2 is air conditioned, with a King sized bed, sitting area, glass walls allowing nature in while maintaining all the comforts. Generous bathroom has his and her sinks feature amenities from the spa. Casita size: 1,700 square feet. Tax and service charges of $79 per room per night additional. Stay a minimum of 2 Nights and up to 8 nights as desired and based on availability.